Condensation Control Wolverhampton: Ventilation of bedrooms and built in wardrobes to solve mould growth and condensation issues. Installation of passive ventilation points to increase airflow. 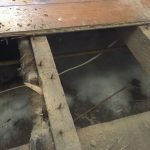 After having built in wardrobes fitted in two bedrooms of their bungalow and having cavity wall insulation carried out our clients began to have problems with a musky smell in the two rooms and also the growth of black mould. Our surveyor soon identified the issue of poor air circulation and high humidity to the areas, the perfect setting for increased levels of condensation leading to mould growth. 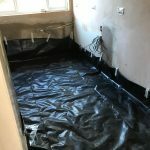 Damp Proofing Solutions carefully accessed where the new passive ventilation points should be installed and proceeded with the work. As the interior of the wardrobes where sectioned off we also created further ventilation to each compartment by drilling ventilation holes to the interior of the wardrobe for extra airflow. Pleasantly surprised with how the guys kept mess and disruption down to a minimum, lovely men who made us feel well looked after, highly recommended.